Wow, has this month flown by or what?! Well, I have finally finished decorating and getting my house back in order. I think this is the latest I have ever finished! 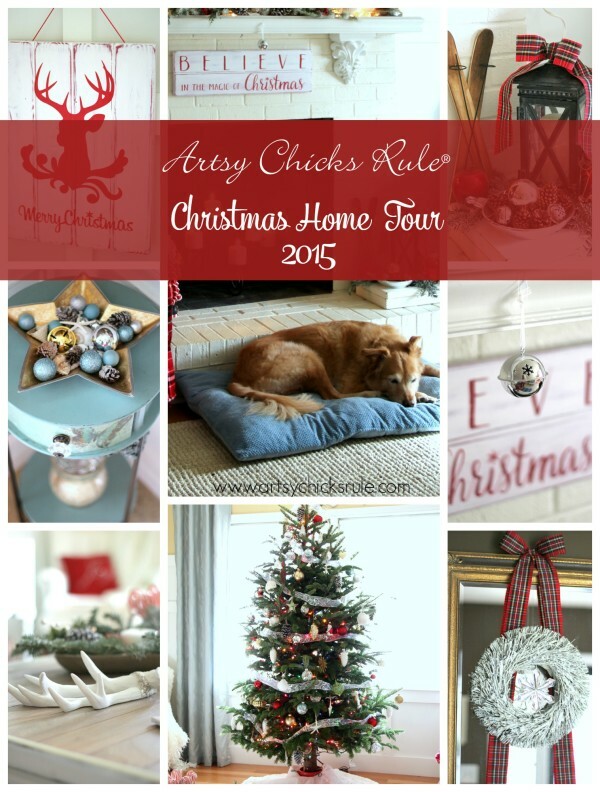 So happy I can finally share my Christmas Home Tour with you all. We have had so much going on around here. Appliances going out, DIY projects to finish and more. But it is done…and now I can finally sit back and enjoy it all. 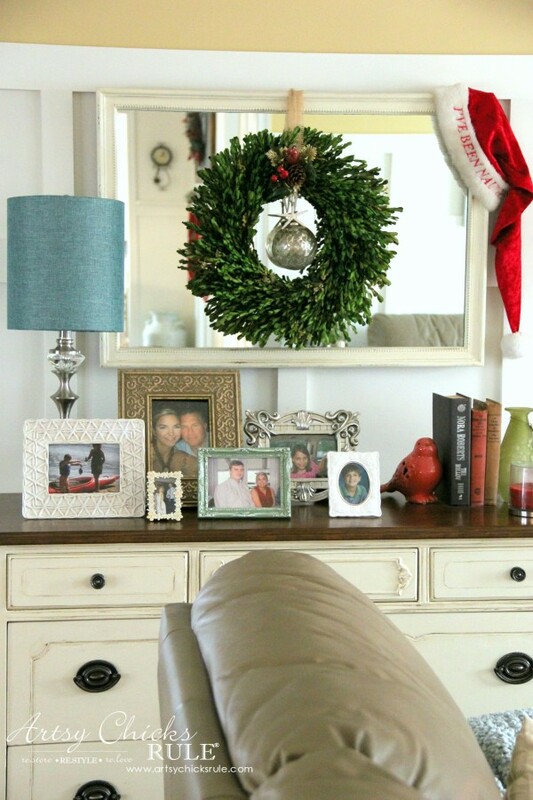 Last year my Christmas decor was mainly teal and red. This year I decided to go a bit more neutral and a little bit simpler. I thought I’d not use much red but it just didn’t feel very Christmas-y without it. 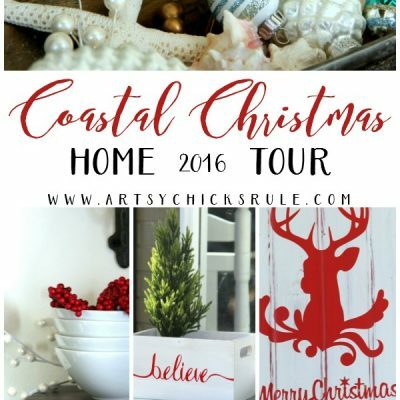 I even added a bit more red to my Coastal Christmas Foyer I shared last week. This plaid ribbon I picked up at Target for $1. I had a few pops of red in here but I thought it just needed a bit more. I’m so happy to have gotten things done and put away. Whew. 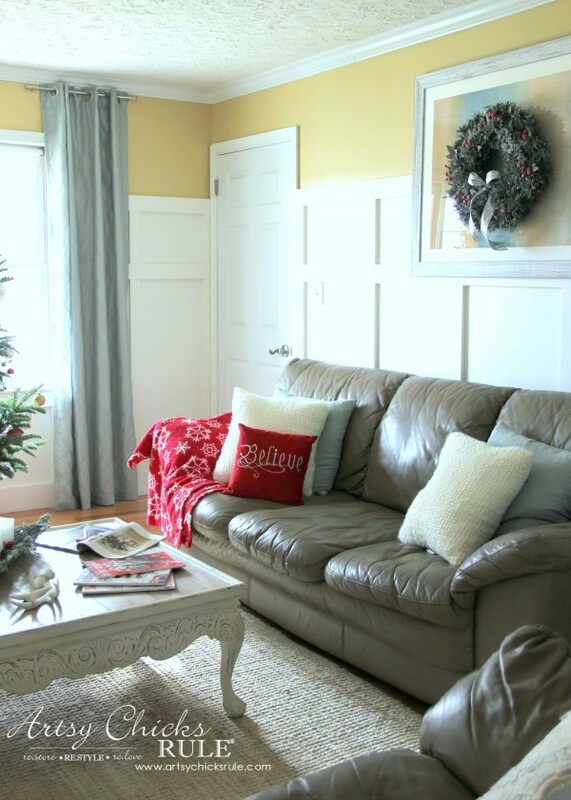 Today I’m sharing my family room and laundry (and foyer). I’ll be sharing my kitchen, dining and study on Thursday. This little decoupaged butterfly table is in the corner by the front door. I decorated it simply with a gold star dish, ornaments and pine cones. Going to the right from the foyer you will be in the family room. And my sweet Lexi girl laying on one of her beds by the “fire”. Aren’t those skis the cutest thing ever? I shared this over on Instagram the other day. The skis were $3 from Target. The silver ornament dish is a thrift store find. The greenery is leftover (flocked) branches from our live tree. And the lantern is from Balsam Hill. 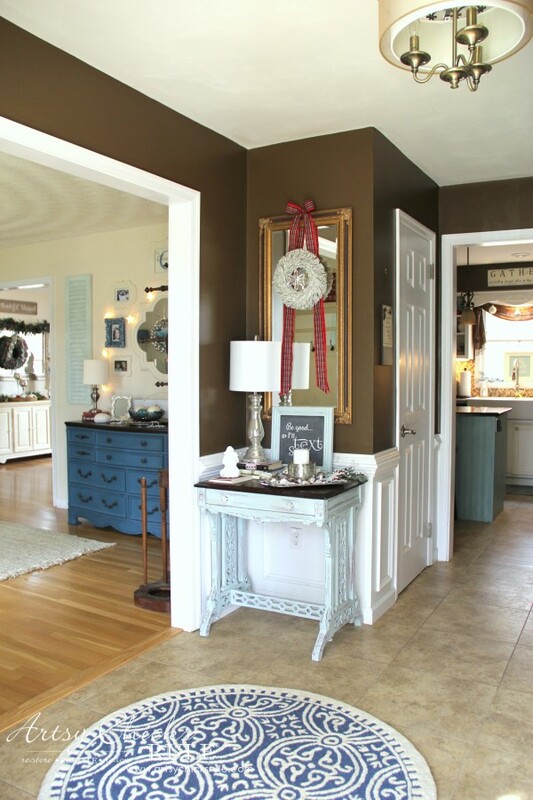 You can seem more of it in my Summer Home Tour –> here. 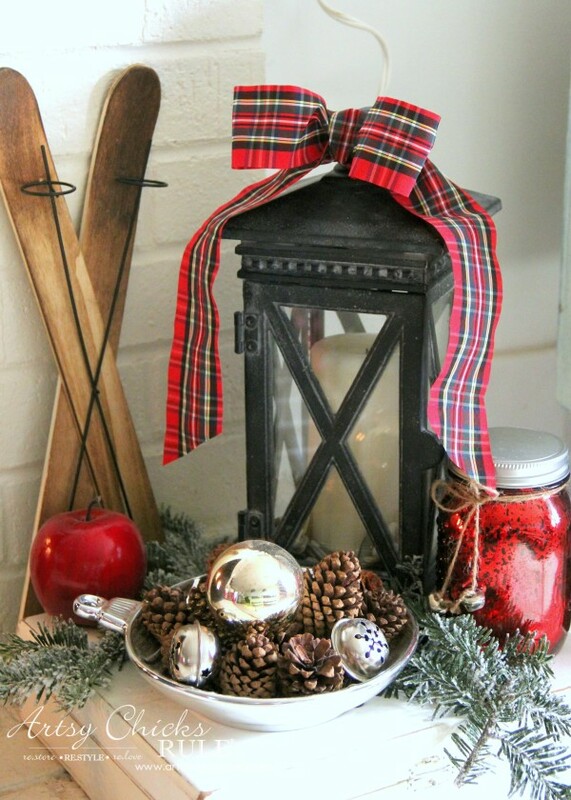 I added more of that same plaid ribbon here. 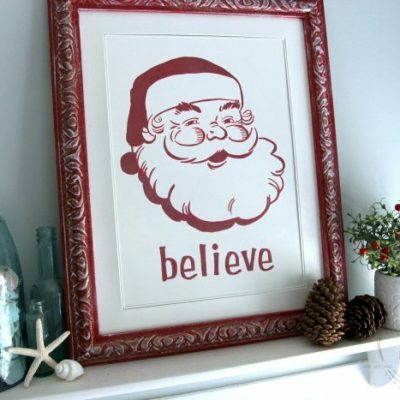 The “BELIEVE” sign can be found –> here. My Nativity that I’ve had for many, many years. 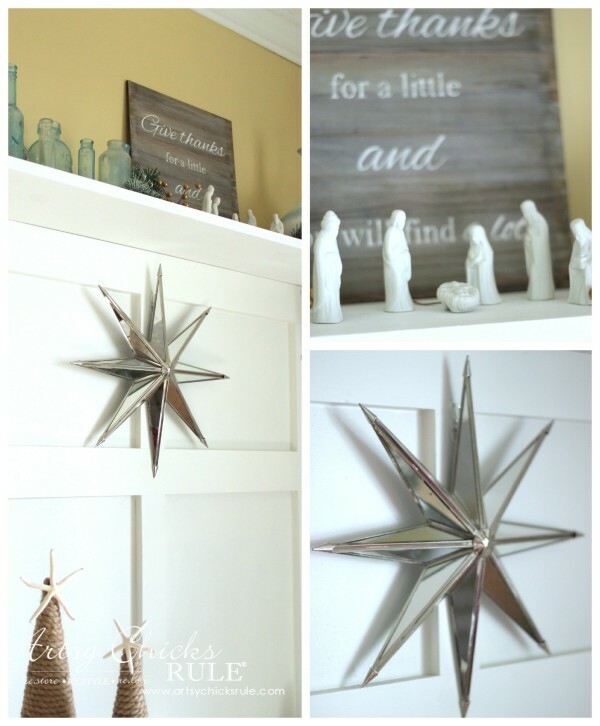 The mirrored star came from Marshall’s. It’s so pretty and shimmery. These little coastal trees came from At Home. 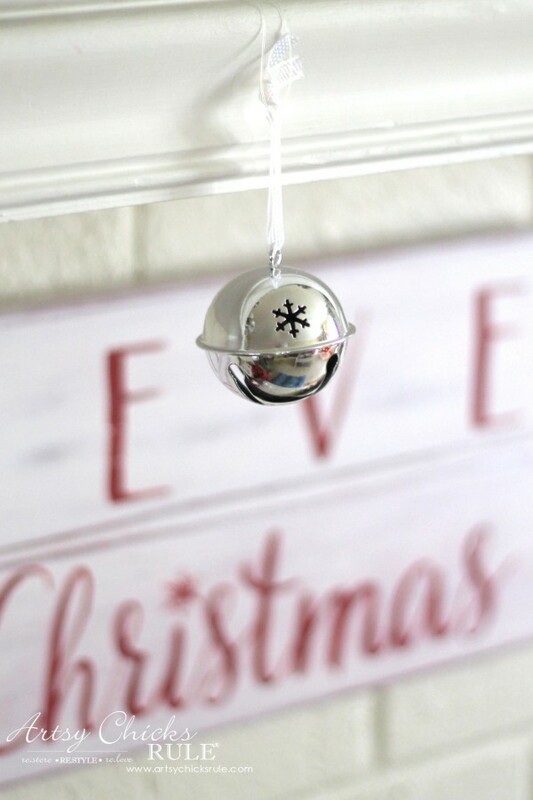 I added a pop of red to the nautical decor with the red ornament and berries. I decided to hang it right over top of this artwork. The off white sweater pillows came from Target. My new “farmhouse style” lights on each side of the fireplace. We bought them recently from Lowe’s and my husband put them up this past weekend. 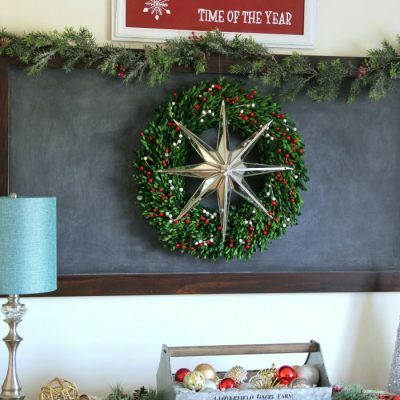 The wreath on the “shutter” is from the thrift store. I used them in the same place as I did last year. I just changed out the ornament. 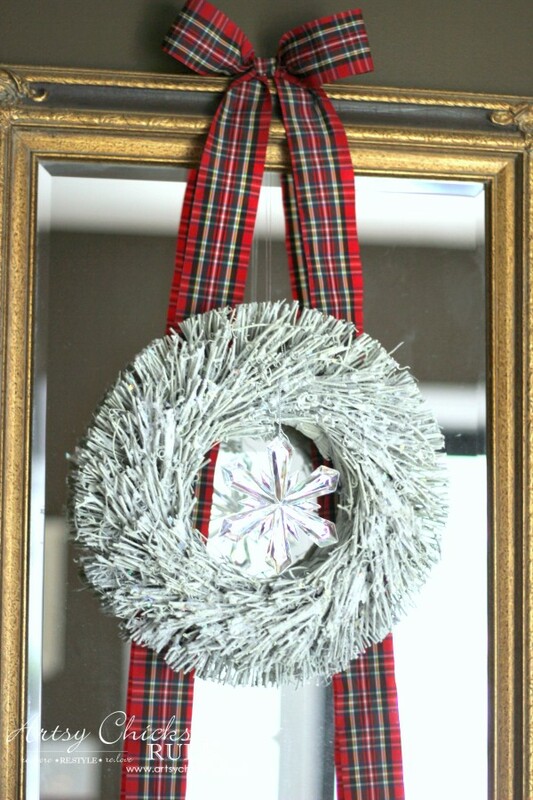 I added an ornament to my boxwood wreath and a Santa hat to the mirror. I bought a few new pillows this year. The plaid bow and the Believe pillows came from Michael’s and their 20% off total sale. What a deal that was on these half off pillows. The (affiliate link, disclosure here) “bushel & a peck” pillowcase came from Amazon. Super inexpensive too! 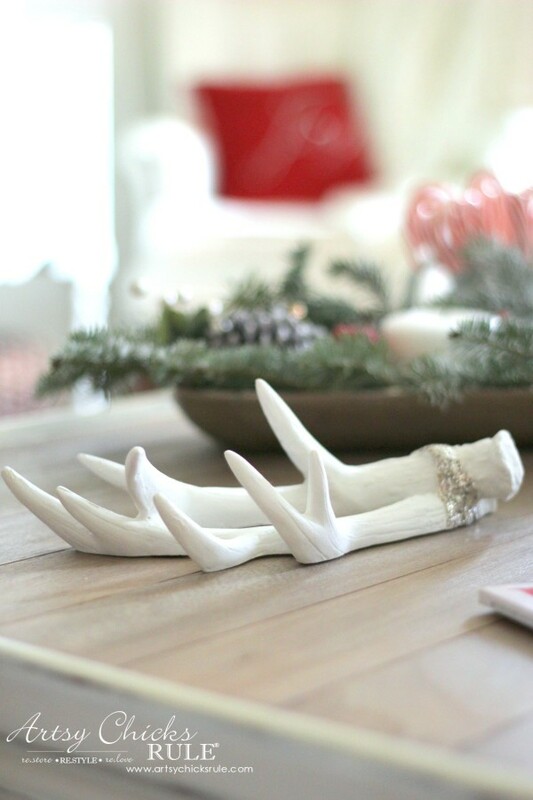 The antlers came from Michael’s also. 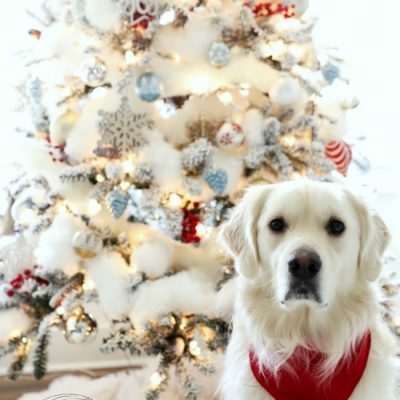 I have to share this photo I took with my Christmas tree in the background…. 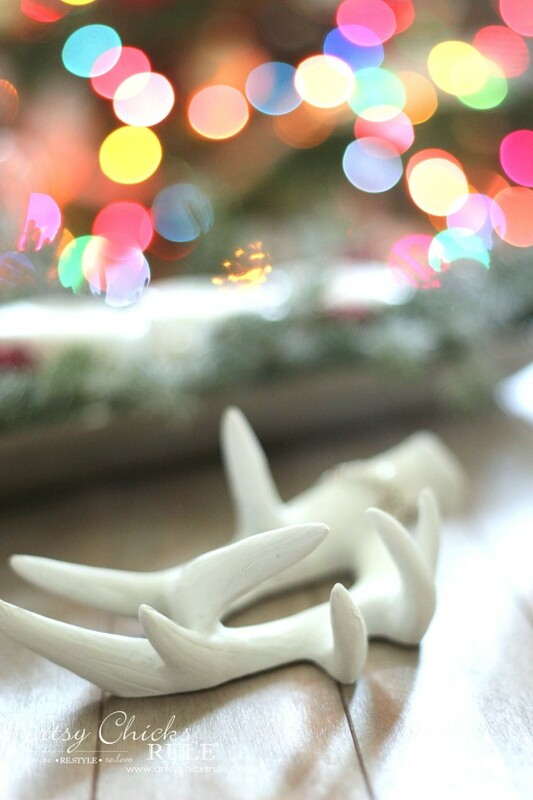 The reindeer wall art can be found –> here. 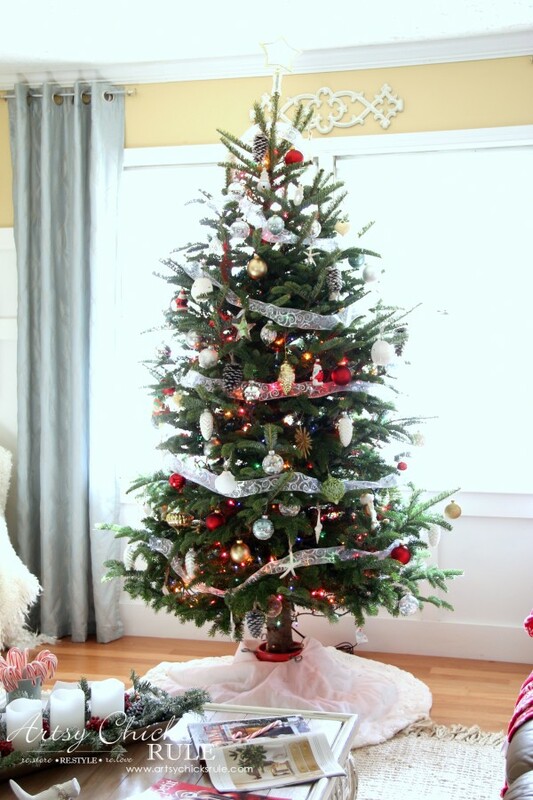 Our live tree this year…. This tree gets the colored lights and the sentimental ornaments. It had a little leakage problem (as in I kept adding too much water). And y’all….do you notice anything different??? How about that table top? That’s another one of the last minute DIY projects we did. It’s a “driftwood-ish” wood top that I created out of the leftover flooring we had for the family room. Anyway, they were pre-finished but I used the back, unfinished side, to stain how I wanted. I’ll be sharing the full details in the new year. I’m liking it so much better. It was time for a change. Just loving the clean look of it. If you want to see what it looked like before, see it –> here. 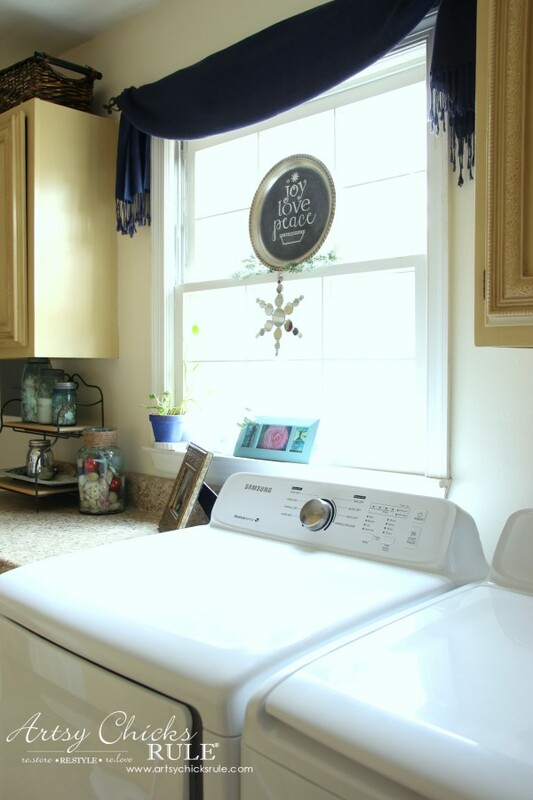 I didn’t do much in the laundry room but I thought I’d share what I did do….. I used the “Joy, Love, Peace” chalk art sign in here this year. Everything is pretty much the same in here otherwise. Except the new washer and dryer…which we literally just got. Last week our 16 year old washer went out so we decided to buy a whole new set. I hung the mirrored star in here this year. And looking back out to the rest of the house…. I’ll be sharing that part of the house on Thursday. 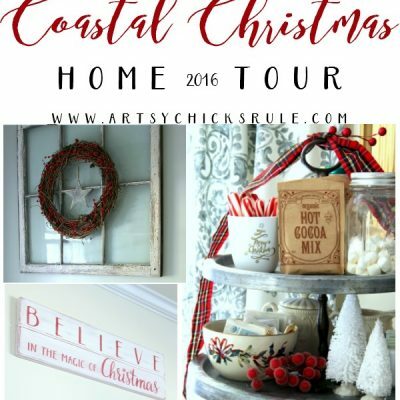 If you are interested in seeing how differently I decorated in previous years, you can see my home tours –> here. 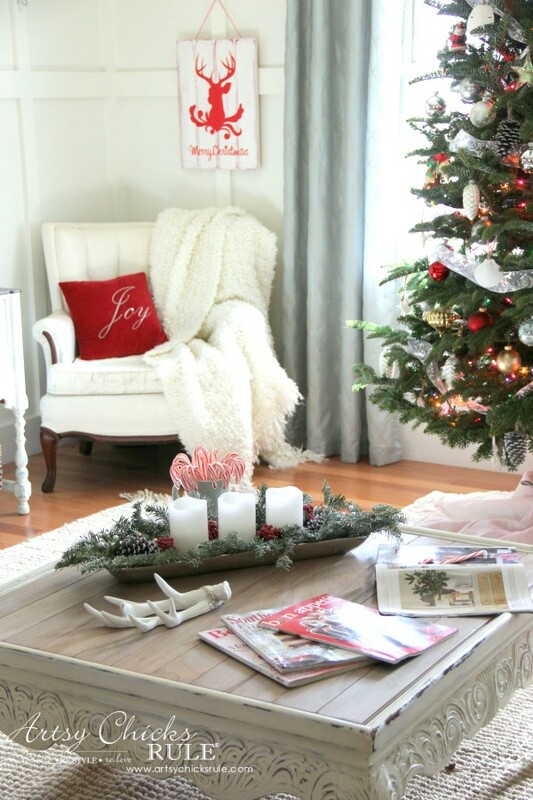 And that wraps up today’s Christmas Home Tour…. See Part 2 –>> here. Thank you so much Sandra! :) I am really enjoying the table! It all looks so pretty! Now that the hard work is done you can really enjoy your decor for the next 10+ days. 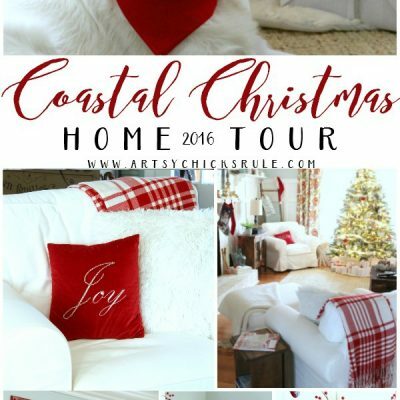 Your home and decor are beautiful! Cheers to a happy day and Merry Christmas! I Love your house! It is very Fresh and Clean! I Love everything! Thank you Marie!! Merry Christmas to you !! 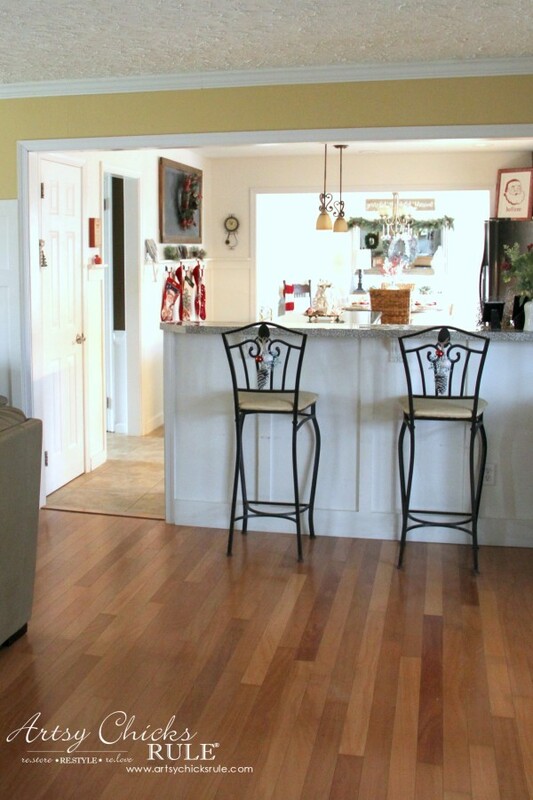 Your home looks beautiful and very inviting! 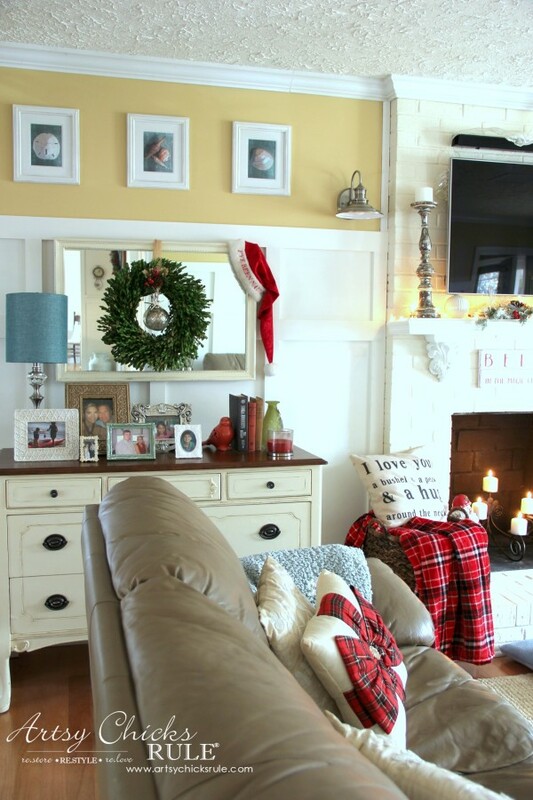 Love the simplicity and your added white decorations with the red accents. 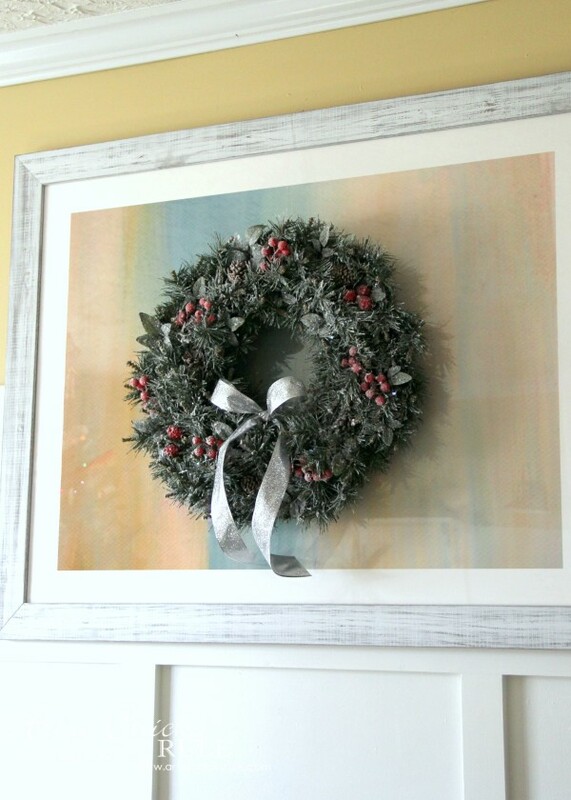 I do love the homes that are exclusively decorated for the holidays with white but I also found that I wanted to include the teal and red as well. 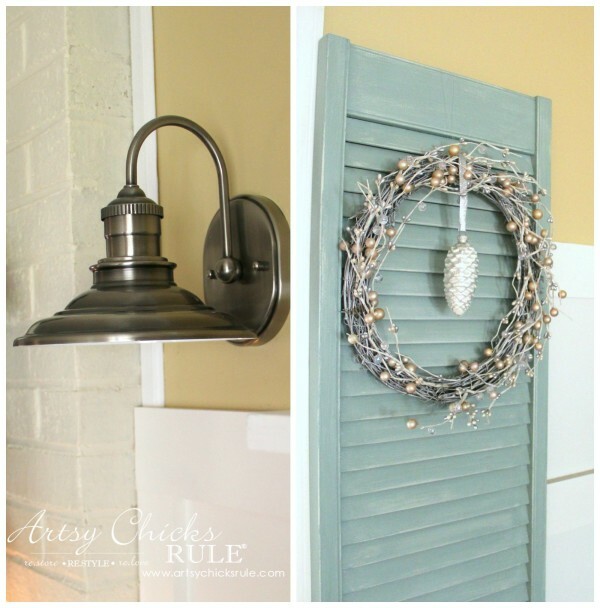 Your décor looks great…. 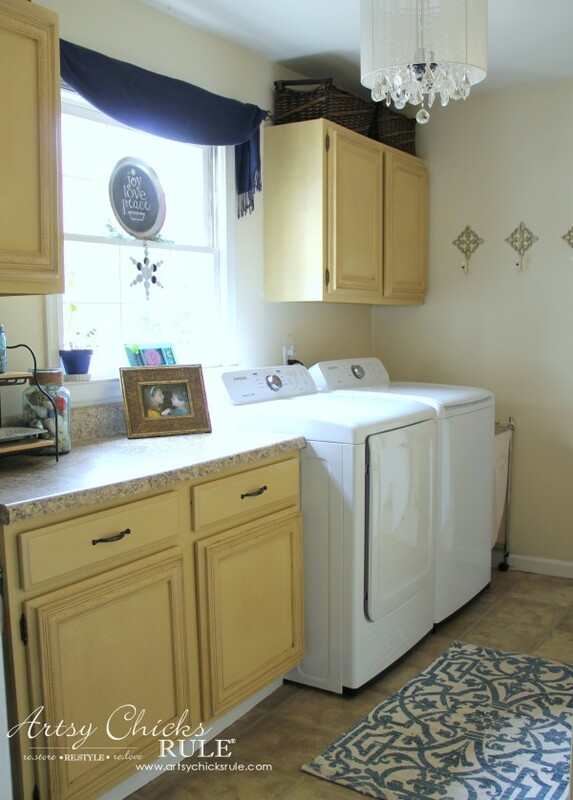 your foyer, family room and newly applianced laundry room! Your Lexi looks so content next to your fireplace! 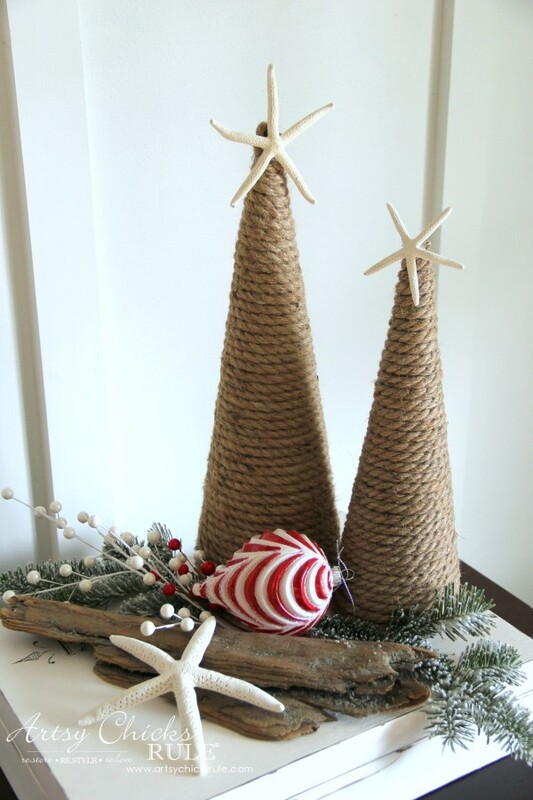 Love the coastal rope Christmas trees from At Home. 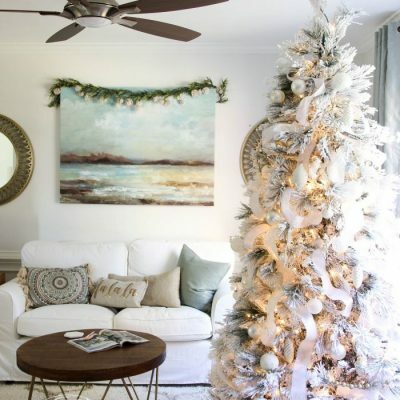 I added a driftwood coastal tree and a little boxwood in a galvanized pot to my Christmas decor and mantel this year…. both from At Home! 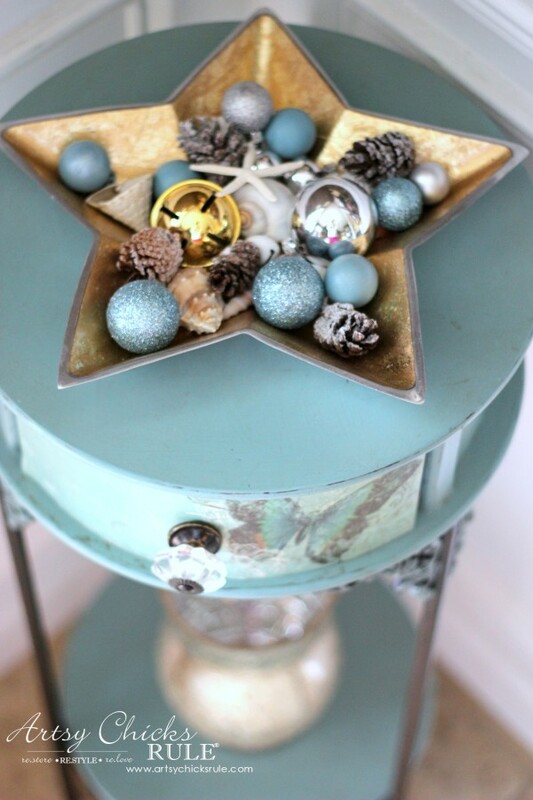 I also found just the right large turquoise and silver ornaments to decorate my greenery in my outdoor urns there! Thanks for sharing about At Home! 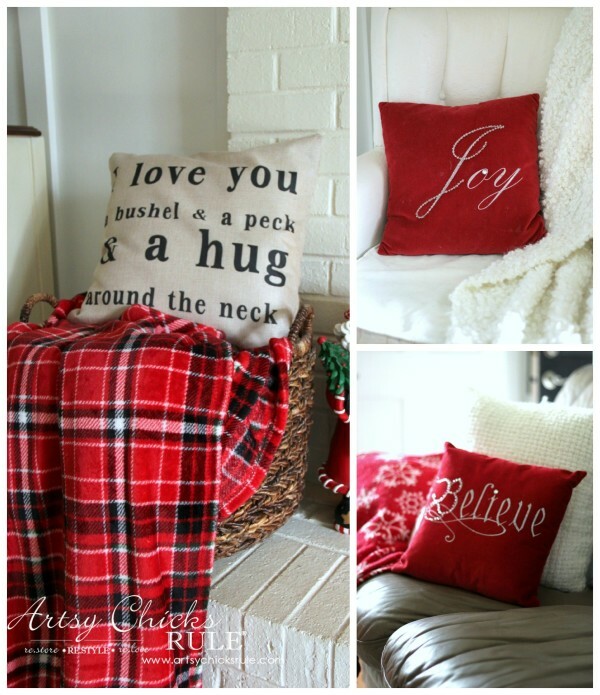 The red pillows and red plaid blanket are so festive! 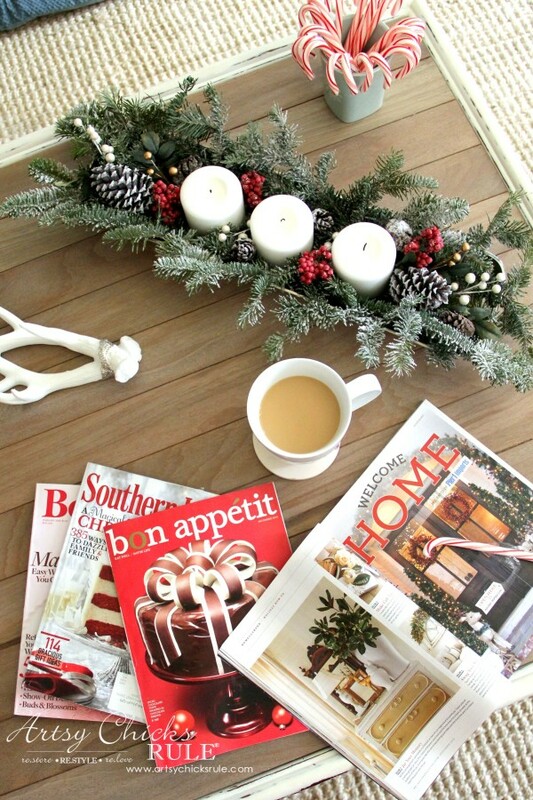 Great idea for your tabletop too! Enjoy your holidays! Merry Christmas Nancy to you and your family! I really enjoyed your Christmas Tour! Oh I’m so happy you liked At Home. I really enjoyed the store! The vase in my centerpiece (dining, part 2) is also from there. They have such great selections on just about everything. I was pretty impressed. Everything looks wonderful, Nancy! Love your new additions and the last year’s goodies, too! 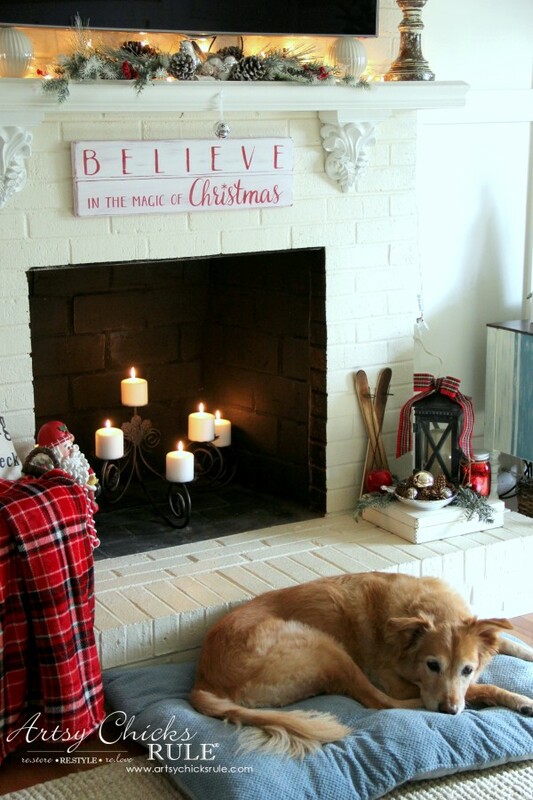 You did a great job decorating… but then you always do! Thank you Karen! :) So sweet!! And yes, Lexi will get extra kisses, for sure! Happy Holidays to you and your family. Thank you for inviting us to your open house. I enjoy reading your blog. Your open heart is clearly evident in your writing and your work. I am so happy you stopped by and thank you also for the very kind and thoughtful words. Love your House Tour this year. 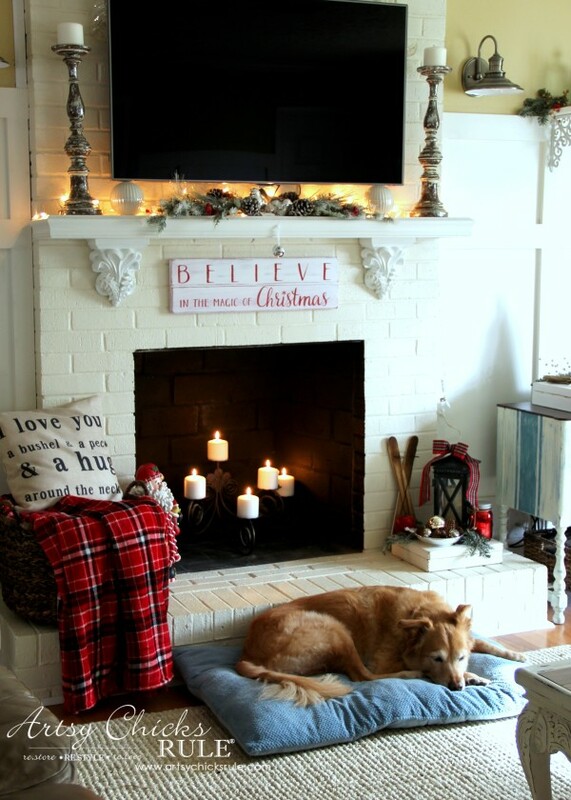 I think the fireplace is my favorite as it is so cozy and inviting. I had forgotten about using candles in the fireplace. Thanks for the reminder. 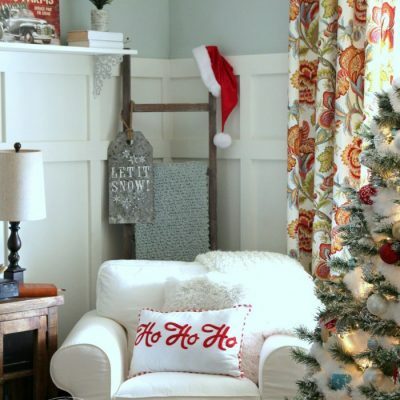 And, your pops of red did make the home feel Christmasy. You did a great job. It’s lovely. I’m loving it so much better!